1.x to 3.x are under the GNU General Public License. 4.x == NYAGOS is under the New BSD License. NYAGOS is the New Commandline shell written with GO and Lua for Windows. From this version, unicode is available. Please see here. NYAOS 3.x - Nihongo Yet Another Open Shell 3.x is the next generation of NYAOS 2.x Series. With Lua, users can customize anywhere on the shell. No longer, NYAOS does not need CMD.EXE. DOS and Windows9x are not supported on this version. 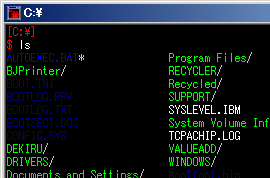 NYAOS 2.x is developed from scratch to support three Operating System (DOS / Windows / OS/2 ). But, '#!' and 'REXX' are not supported. NYAOS is born to provide the commandline like UNIX and fit for OS/2 environment. Command-line editor like tcsh/wordstar. It can be customized. Understand '#!' like unix. Of course, BATCH and REXX can be executed. Colored ls which can prints comments and longname in EA.